Charles Wheelan is the latest in a long line of would-be political reformers who have looked at the two party duopoly in the United States, found it wanting, and proposed the creation of a new third party as the solution. 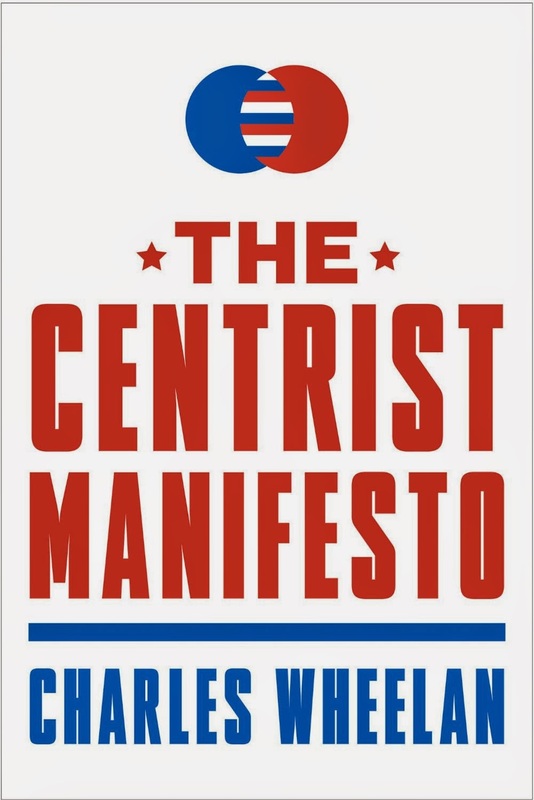 He outlines his strategy for a Centrist Party in his 2013 book The Centrist Manifesto and continues to beat the drum on his website/blog The Centrist Project. True enough, as far as he goes, but Wheelan does not quite connect the dots on just how truly hostile the American political system is to third party efforts. In particular, he fails to note the pointless futility of third party presidential campaigns. If third party presidential efforts are not completely irrelevant, it's only because of their potential to be spoilers. Most recently, the 2012 Americans Elect and 2008 Unity08 efforts (generally acknowledged to be stealth Michael Bloomberg for President vehicles), hoped to trade on the same frustrations over our "broken" political process identified by Wheelan to put a new third party candidate for president on the ballot in all 50 states. They never got any real traction. As further noted by Wheelan, Ralph Nader's failed 2000 Green Party presidential run undoubtedly spoiled Al Gore's efforts and elected George W. Bush. Ross Perot garnered 19% of the popular vote in 1992 and succeeded only in helping elect Bill Clinton. In 1968 George Wallace arguably siphoned enough popular and electoral votes from Democrat Hubert Humphrey to give Richard Nixon the White House. Third party Presidential campaigns that do not asymmetrically impact enough votes to spoil the election for one of the two major party candidates are simply exercises in irrelevance. Count John Anderson's 1980 campaign and Ron Paul's 1988 Libertarian Party runs among them. Ron Paul is a particularly interesting case as he ran for President both as the Libertarian Party nominee and in primary campaigns to secure the Republican Party nomination. While all his efforts failed, there is little doubt that Paul's impact on American politics was much greater in his 2008 and 2012 campaigns for the Republican nomination than his third party effort heading the Libertarian Party ticket. It is instructive to note that in recent cycles the Libertarian Party presidential candidates have actively embraced the spoiler label. Presumably it's better to be a spoiler than completely irrelevant. To fully appreciate just how hopeless third party presidential runs are in American politics, consider the 1912 Bull Moose campaign of Teddy Roosevelt. In Teddy Roosevelt we had a highly qualified, wildly popular ex-president who also served as Vice-President, Governor of New York, and Secretary of the Navy. He was a Nobel Peace Prize winner, a true war hero, and Congressional Medal of Honor winner. He championed a platform rooted in the same populist, centrist politics that is the very essence of Charles Wheelan's Centrist Party strategy. And what was the result? He garnered 27% of the popular vote, handily beat the Republican Party candidate in both popular and electoral votes, but nevertheless succeeded only in splitting Republican Party votes and ensuring the election of Democrat Woodrow Wilson. The Bull Moose Party lasted exactly one election cycle. Ultimately, like Ralph Nader and Ross Perot, Teddy Roosevelt's impact was nothing more than just another spoiler who sabotaged the major party candidate closer to their own political position. If Teddy Roosevelt could not get elected President on a third party ticket in the United States, no one can. While Wheelan does not specifically mention the historical futility of running a third party presidential campaign, he clearly understands that it is a path that leads to failure. His third party strategy neatly sidesteps this political land mine by simply not focusing on the Presidential race. "The Centrist electoral strategy revolves around the U.S. Senate. The party will focus on winning a handful of U.S. Senate seats in states where moderate candidates traditionally do well. With a mere four or five U.S. Senate seats, the Centrists can deny either traditional party a majority. At that point, the Centrists would be America’s power brokers. Nothing could happen without those swing votes. And when those swing votes represent sensible, moderate voters— rather than the non-compromising extremists of the Left and Right—good things can start happening again. The Centrist Party will organize the vast American middle into a political movement built around sensible governance. It is more feasible than you might think." - The Centrist Manifesto (pp. 12-13) - Kindle Edition. This is the core concept of The Centrist Manifesto and what Wheelan calls "The Big Idea". It is, in fact, a big idea because it is a third party strategy that can work. Unlike the Presidency, Independents like Angus King can and do get elected to the Senate in the United States. The modest goal of electing a handful of Senators who will act as a swing vote to moderate and broker the legislative agenda for the federal government is reasonable. Yes, It's still an extraordinarily difficult task. It still entails soliciting massive funding and creating all of the infrastructure of a national political party. It still entails convincing a significant voting block to organize around Centrist Party principles and identify as Centrist Party members. It still entails recruiting serious candidates of national stature to run under the Centrist Party banner. It's still an extreme long shot. But it could work. "Think of it this way. An election is a scale. Pile the large mass of partisan Democrats on one side and the large mass of partisan Republicans on the other, roughly balancing the collective polarized "Partisan Dead Weight" (PDW) that can be relied on to always gets on one side or the other. Then there are some smaller, more mobile weights, that call themselves Independents. However, the reality is that Independents almost always identify more closely with one party or the other, so that when it is crunch time, when it is time to walk in that voting booth, most Independents will decide among the "lesser of two evils" which, by definition, is the party they already identify with. So most Independents are really in that same category of "Partisan Dead Weight". The true Independents tend to cancel each other out, and are not sufficient in number to change an election. ... So what if the "true" independents that dislike single party rule, start voting for divided government consciously? ... The effect would be like a third party. 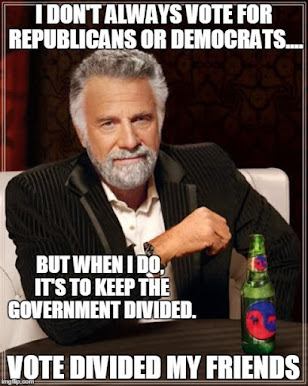 Lets call it the "Dividist" Party (the 2nd "i" is pronounced "eye" - Div-eye-dists). It could change elections in the same way 3rd parties do, by siphoning partisan support. The beauty of this idea is that this party needs no candidates, no leaders, no platform, no conventions, really none of the trappings of a political party. Dividist party members are voting by objective, not by platform and not out of party loyalty." "The interesting question is whether a relatively small group of enlightened voters, by voting in concert, sometimes Republican and sometimes Democrat, can achieve these objectives by voting specifically to maintain a divided government in Washington. It would not take many voters to pull this off, perhaps as few as 5% of the electorate. 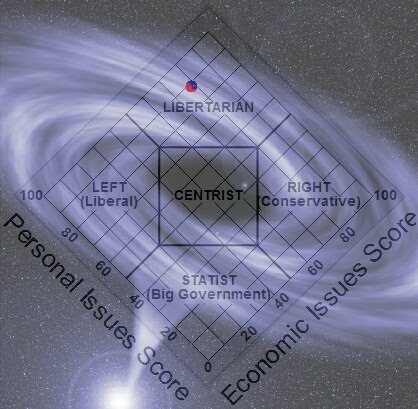 If those voters could be organized around these principles, a relatively small number of centrist, independent, libertarianish voters could have an outsized influence driving these objectives by voting consistently for divided government." Wheelan hopes to shape federal policy and legislation in a more centrist direction by electing a handful of swing vote independent "Centrist Party" Senators who will be a moderating influence in the Senate and directly broker more centrist compromise legislation. The Dividist hopes to shape federal policy and legislation in a more centrist, libertarianish direction by convincing a relative handful of independent swing voters to never let either major political party control both the executive and legislative branches. This will ensure that federal government policy and legislation will be either moderated, compromised, bipartisan and centrist, or there will be no legislation at all. These are complementary strategies with compatible objectives. In fact, maintaining a divided federal government is a necessary (if not sufficient) condition to implementing the Centrist Manifesto strategy. 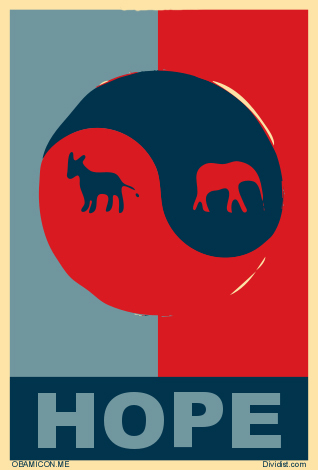 If either major party is elected into unified single party control of the executive and both legislative branches of Congress, particularly if they also have a filibuster-proof supermajority in the Senate - as did the Democrats in 2009 - then a handful of Centrist Party Senators will be as irrelevant as Republicans were in 2009. Wheelan's Centrist Party senators need divided government to be effective brokers of centrist policy. Once elected, there is still the problem of keeping these independent Centrist Party senators in the fold once they are in the Senate. Choice committees, chairmanships, increased influence and more bacon for the home state await independent senators who caucus with the majority. But that is a future problem that is really more like a goal. We can worry about that after Wheelan demonstrates the Centrist Party can actually get organized and elect a few senators. This notion of an untapped Independent plurality has long been the conceit of moderates, independents, centrists and even small "l" libertarians. Here is the problem - The conditions for this premise has been in place for at least 25 years. It was the same premise articulated by Ross Perot whose abortive campaign spawned the Reform Party later co-opted by the aforementioned Jackie Salit's progressive junta. Perot's old party is now just a shadow of the political hammer he wielded in 1992. The big question about Wheelan's big idea - if centrist policies are so compelling, if the Independents are so numerous, why does every independent insurgency fizzle out on a national level? We submit the reason no third party Independent insurgency has happened to date and will likely not happen in the future, is that the 40% Independent plurality is a mirage. How voters self-identify in a self-serving response to pollsters may be mildly interesting but it is not a basis on which to build a political movement. Yes, it is a fact that something like 40% of the electorate self-identify as Independents. The problem is that at least 2/3 of those so-called "Independents" have voting records that are indistinguishable from those voters self-identifying as partisan Republicans and Democrats. They are, in fact, functional partisans as determined by the way they vote at the Federal level. At least 1/3 of the "Independents" always vote like partisan Republicans and another 1/3 of the "Independents" always vote like partisan Democrats. This is a well known, documented, historical fact in the world of political science. These "independents" are not voting like partisans because they don't have other choices. They vote like partisans because they are more comfortable with and lean toward one party or the other. Where the rubber meets the road, in the voting booth, they are pure partisan voters at the federal level. It is important to be realistic about the size and nature of the truly Independent vote that can actually be seen to swing between major parties from one election cycle to the next. John Sides cites polls and the 1992 book Myth of the Independent Voter to arrive at "pure independents" representing 10% of the electorate and shrinking. Another analysis that tackles this question comes from The Cato Institute. In a series of policy studies, they've identified a "fiscally conservative, socially liberal" voting block representing about 14% of the electorate that was documented to swing in the 2002 - 2010 elections. The Cato Institute being the Cato Institute, it identifies these voters as closet libertarians. That identification is a reach. These voters do not self-identify as libertarian, and many would recoil from strong libertarian positions. At best you could call them libertarianish. Then again, it might not be a problem. While Wheelan cannot rely on that bogus 40% "Independent" voters statistic, he can rely on strong, appealing Independent candidates getting elected to the Senate, whether he/she identifies as a Centrist, an Independent like Angus King of Maine, a Democrat like Joe Manchin of Pennsylvania or a Republican like Rand Paul of Kentucky. In fact, it may make more tactical sense for Wheelan to first work to get more centrist Senators elected on the Republican and Democratic tickets. After an effective caucus is established in the Senate, convert them en masse. It is entirely conceivable that a 5 Senator block could write their own chairman and committee tickets by determining who they will caucus with and make the majority party in the Senate. While we like the strategy overall, we do have a few more quibbles with Wheelan's approach. He deserves credit for a staking out a series of political positions on controversial issues and identifying them as common sense "centrist positions." However, we sincerely doubt that the 70% closet partisans in his target 40% "Independent" voter block will agree with his policy characterizations. In fact, we are not sure we agree with his characterizations. Particularly on anthropogenic global warming, campaign finance, and gun laws. This is the crux of the problem. There really are no "Centrist" policy positions. There are only compromise positions that emerge after hard fought negotiations that wind up somewhere between the partisan positions staked out by the right and left - satisfying neither. Any such compromise moderate centrist positions will undoubtedly make those partisans and "leaners" on the right and left equally unhappy. And there are a lot more partisans than there are "centrists". That's the reason it's a risky proposition for Wheelan to crown himself arbiter of the common sense Centrist policy. He doesn't get to decide. Still, without staking out policy positions, you cannot create a Party. It's the nature of the beast. Net net... Wheelan has come up with a strategy that could potentially tame the partisan beast, but it won't be easy. The Dividist has another strategy. And it's a lot easier. 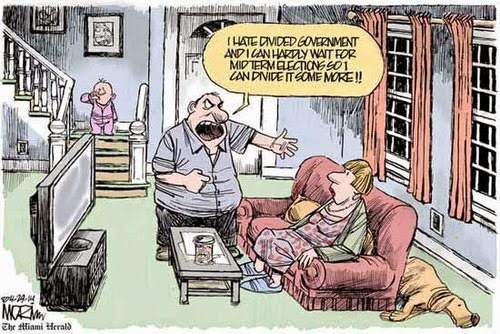 Just keep voting to keep them divided until they figure out they have to compromise. No matter how long it takes.